Lockheed Martin embraced Vice President Pence's call to accelerate a human return to the moon, saying it could use technology it's developed for the Orion spacecraft for a lunar lander. Pence, speaking at a March 26 meeting of the National Space Council, directed NASA to use "any means necessary" to accomplish the goal, including adopting commercial vehicles, non-traditional contractor approaches and, if necessary, getting rid of contractors who are unable to meet this new goal. While both Pence and NASA Administrator Jim Bridenstine said the Space Launch System would be an essential part of the agency's plans to achieve that goal, Pence's comments about removing contractors appeared targeted at Boeing, whose struggles developing the core stage of the SLS had threatened to delay the vehicle's first launch to 2021. Bridenstine said in a later statement that NASA was examining "creative approaches to advance SLS manufacturing and testing" to keep the vehicle's first launch in 2020. He didn't elaborate on those approaches, but industry sources previously said one option will be to skip the "green run" test of the SLS core stage, where it is shipped to the Stennis Space Center in Mississippi for a full-duration burn of its four RS-25 engines, a move that could remove several months from the schedule. "Boeing and NASA have implemented changes in both processes and technologies to accelerate production, without sacrificing safety or quality, and we remain on schedule to deliver the first SLS core stage to NASA by the end of this year," Boeing spokesman Jerry Drelling said in a statement to SpaceNews after the hearing. The company, he added, will do "what is absolutely necessary" to keep the first SLS launch on schedule for 2020. "NASA has affirmed that SLS remains the best approach to achieve our lunar objectives with a reconfirmation of the importance of the Exploration Upper Stage by EM-3," the third SLS launch, he said. NASA, in its budget proposal released just earlier this month, had proposed deferring work on that upper stage until at least the mid-2020s. "America needs SLS' deep-space capability in order to maintain our leadership in human space exploration." Lockheed Martin, the prime contractor for Orion, embraced the new goal announced by the vice president. "Lockheed Martin fully supports accelerating NASA's goal of landing humans on the surface of the Moon," the company said in a statement after the council meeting. "With the right level of commitment, urgency and resources, humans could walk on the surface by 2024." 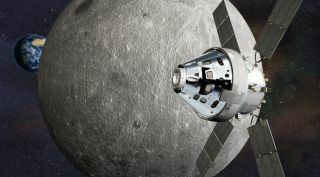 Lockheed Martin revealed it has been working on concepts for an "accelerated landing schedule" that would make use of the Orion spacecraft as well as a truncated version of the proposed lunar Gateway that had only a power and propulsion element and a docking node. The company said it could also create a crewed lander that makes use of avionics, structures and propulsion systems developed for Orion. "This is an aggressive but achievable schedule, and could be the catalyst to help jump-start a new era of human exploration of the Moon, Mars and beyond," the company concluded. The willingness to use commercial capabilities attracted the interest of SpaceX Chief Executive Elon Musk. "It would be so inspiring for humanity to see humanity return to the moon!" he tweeted in response to a NASA tweet about the vice president's remarks. Asked later on Twitter if the company's next-generation launch system, including the Starship upper stage capable of landing on the moon, would be ready by 2024, Musk was optimistic. "I think so. For sure worth giving it our best shot!" he said. "Would be great to have a competitive, commercial program to build a moon base that is outcome-oriented (not cost-plus), so you only get paid for safe delivery of cargo." The Coalition for Deep Space Exploration, an industry group whose members include many companies involved in NASA's current exploration plans, struck a cautionary note. In a statement, it supported the overarching goal of accelerating a human return to the moon and doing so by any means necessary. "Though we support the focus of this White House on deep space exploration and the sense of urgency instilled by aggressive timelines and goals, we also are cognizant of the resources that will be required to meet these objectives," it added. "Bold plans must be matched by bold resources made available in a consistent manner in order to assure successful execution." Members of Congress, who will have to provide those bold, consistent resources, have been largely silent since the council meeting. However, Bridenstine is scheduled to testify before the commerce, justice and science subcommittee of the House Appropriations Committee on March 27 in a previously scheduled hearing on NASA's fiscal year 2020 budget proposal. Also left confounded by the announcement were representatives of other space agencies that NASA has been courting as international partners for its plans. During a panel discussion at the National Academies' Space Science Week event here shortly after the council meeting, David Parker, director of human and robotic exploration at ESA, showed a NASA chart from February that illustrated how SLS and other rockets could enable a human lunar landing in 2028. "This is NASA's architecture for getting to the moon when I woke up this morning," he said. "Maybe it's evolved over the course of the day." The proposal to move up a human return to the moon by four years also raised questions about what will happen to NASA's plans to send robotic precursor missions in advance of the first crewed landing. That issue is heightened by Pence's announcement that the human landing will take place at the south pole of the moon, a region that may harbor concentrations of water ice. "NASA already knows that the lunar south pole holds great scientific, economic and strategic value," he said. During a later panel session at the council meeting, Jack Burns, a University of Colorado astrophysicist, noted it's not known in what form, and what concentrations, that water ice is at the moon. "Before we put boots on the ground at the poles, we urgently need a robotic water ice prospecting mission," he said. "We need a mission in the next couple years to get this going." However, many in the scientific community question the ability to carry out such a complex mission in a short time. NASA last year cancelled Resource Prospector, a lander mission with a rover intended to go into permanently shadowed lunar craters to seek water ice, in favor of supporting commercial landers through the Commercial Lunar Payload Services (CLPS) program. The agency also proposed last year developing medium-sized landers, larger than the CLPS spacecraft, but the agency's fiscal year 2020 budget proposal did not mention such landers, instead proposing development of a rover that could be carried on a commercial lander. He suggested companies might be able to carry out such missions as soon as this year, although "the goal, of course, is 2020." Such missions carry risk, he said, but "if they are successful the return is exceptionally high, especially if we want to get boots on the moon in 2024." However, during a side meeting March 17 at the 50th Lunar and Planetary Science Conference near Houston, six of the nine CLPS companies said they would not be able to fly their landers this year. Those companies said they're targeting launches some time between the second quarter of 2020 and the end of 2021. Dan Hendrickson, vice president of business development at Astrobotic, one of the CLPS awardees, noted on that conference panel that the company's first lander mission, scheduled for launch in early 2021, is intended to operate for only eight Earth days, and isn't designed to survive a lunar night. "We're really building the first railroads to the moon," he said. "Hopefully we don't get ahead of ourselves and expect certain capabilities to be there. They will be there. We're going to get there, but we're taking this one step at a time."